After trying my hand at coconut bacon and loving the flavor, I was left hoping for a texture that was closer to the real thing. 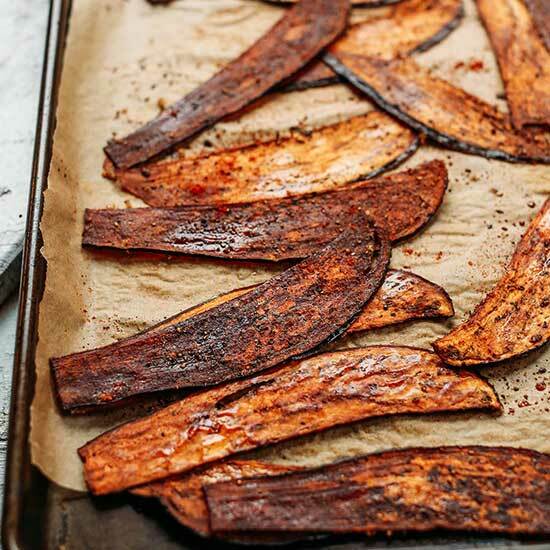 We’ve used eggplant to make delicious things like Baba Ganoush, Harissa Eggplant Dip, Eggplant Lasagna Roll-Ups, and Cashew-Less Vegan Queso, but bacon may perhaps be its most brilliant use yet. This recipe is simple, requiring just 10 ingredients (and it comes together in about 40 minutes). Thin strips of eggplant are marinated in a mixture of smoky spices, maple syrup, tamari, and vegan Worcestershire for the ultimate savory, sweet, spicy flavor. The eggplant is then baked at a low temperature for 20-30 minutes or until golden brown and crispy. The result is crispy, smoky bacon-like strips that are 100% vegan and 100% delicious. 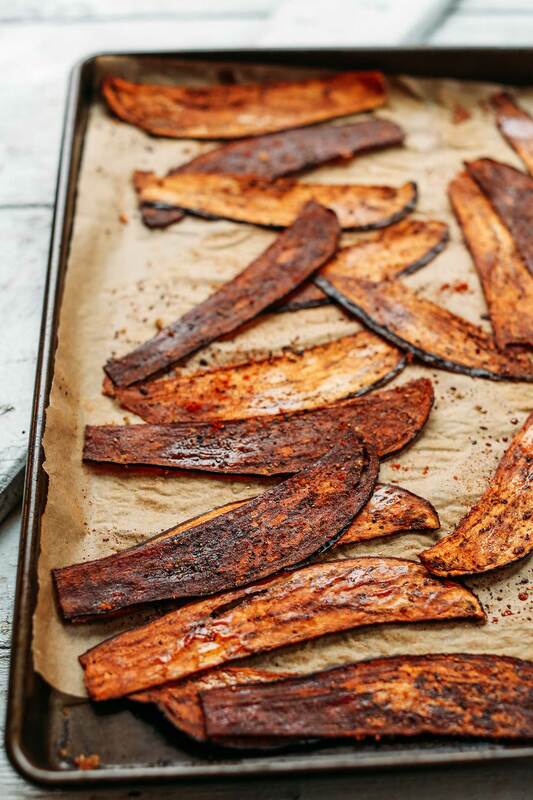 How does one use eggplant “bacon,” you ask? Great question. I enjoyed mine directly from the pan (true story), but it would also be delicious mixed into (or served alongside) a tofu scramble, layered on a sandwich (more to come soon! ), or atop salads, dips, and so much more. Crispy vegan bacon made with eggplant! Sliced eggplant is brushed with a smoky sauce and baked to perfection! A tasty, plant-based bacon alternative. Preheat oven to 225 degrees F (107 C) - turn to “convection bake” if you have it to speed cooking time. Line 1 large or 2 small baking sheet(s) with parchment paper (amount/size as original recipe is written // adjust if altering batch size). 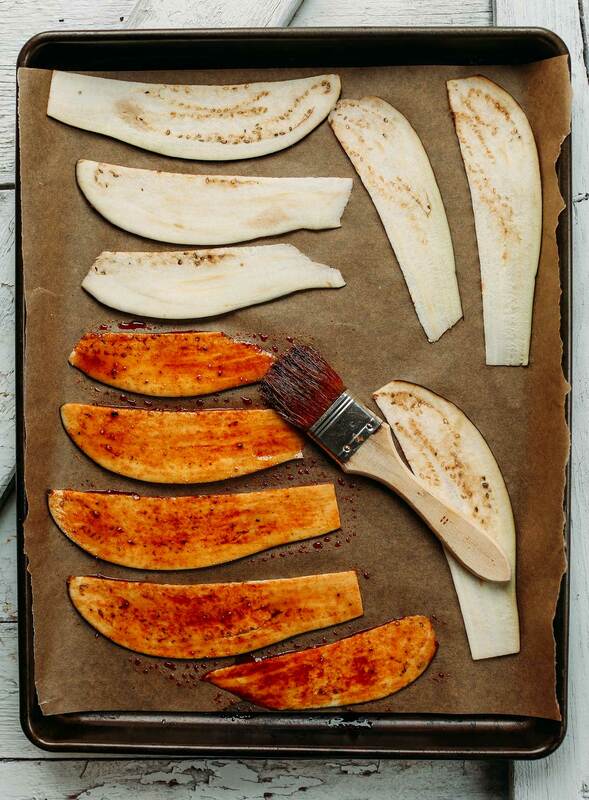 Slice an eggplant in half lengthwise and set one half aside for other uses (such as Baba Ganoush, Vegan Queso, or 1-Pot Pasta). Then cut the remaining eggplant in half lengthwise once more so you have two long, skinny pieces. Use a sharp knife or mandolin to slice into very thin strips (resembling the size/shape of bacon). They should be thicker than paper thin - roughly 1/8th inch. Set aside. Make sauce by adding avocado oil, tamari, Worcestershire sauce, maple syrup, liquid smoke, paprika, sea salt, garlic powder, and black pepper to a small mixing bowl and whisking to combine. Use immediately on things such as on sandwiches, in salads, or alongside or mixed into a tofu scramble. Once cooled, store in a sealed container in the refrigerator up to 5 days or in the freezer up to 1 month. To reheat, heat a skillet over medium heat, add a little oil of choice, then heat bacon on both sides until warmed (be careful not to burn). This was super tasty. I agree with the other comments about temperatures; I turned mine up to 350 and they still weren’t crispy after a while, but they were yummy anyways. Do you think it will work without oil? I try to avoid them. I just made these and still waiting for them to become crispy, been in the over for almost an hour now. Very soggy. First off, I love this recipe. The marinade is spot-on perfect as is, but is also very agreeable to the modifications most cooks eventually make to any recipe. I used soy sauce, a mix of vinegars (balsamic and ACV for bite and red wine and rice wine for a dash of sweet), added a few of my usual “house” spices (tumeric, cumin, and coriander for example) and it turned out fantastic. But I used my pizza rounds (with holes in them). That worked pretty well, but at 250° it took f..o..r..ever 😄 and still didn’t crunch up right. So I shifted strategies with my next batch (made 3 back to back). What worked for me was 350° for 5 minutes, then back off to 250° for 5 minutes, then back to 350° for 5, and so on. Once they’re close to “done” you have to watch them very closely (else they’ll burn a bit -still taste great to us but may not be everyone’s best taste). Setting the temp to 250° at that point and leaving it there for while would probably work. I also turned them over in the last 5 minutes of cooking, to aid crunchiness. This took cooking times from 50+ minutes with no crunch, to 15ish minutes and perfect crunch. They’re also fantastic reheated in a toaster oven for a couple of minutes. I have the eggplant in the oven right now. It’s been at 225 degrees for 20 minutes and far from crispy so I bumped it to 250 degrees for 10 minutes and basically no change. So I just bumped it to 400 degrees for 10 minutes and we shall see! It smells amazing! Just need it to get crispy. You are the only person whose gotten me to eat and enjoy eggplant, first with the queso and now the bacon. Well played, Dana. This stuff was awesome, did my my happy dance while eating the BLT. I’ve made several of your recipes and they always turn out great. Thanks so much for sharing. I don’t know what happen with this recipe but I followed the recipe as written and I came out with floppy eggplant never crispy. My oven is at correct temperature. I will continue to follow your recipes because everyone 8 tried was awesome until This eggplant bacon. Sorry to hear that this recipe didn’t turn out for you! It seem as though others have had the same issue and I will pass along the feedback. Gave it try today. I would say that prep and cooking times are dramatically longer than on the recipe. I was a good half hour slicing the eggplant and mixing the spices. Cooking takes forever at the suggested temperature (though I am sure the temperature is correct). I eventually ran out of time (an hour later) needing to tend to my appointments. Then I raised the temperature and (of course) burned the strips, so I will have to try the recipe again when I have LOTS of time. The sauce was incredibly tasty but I could not get the texture right. I sliced the eggplant very thin and baked it as the recipe suggested and all of the eggplant was still soggy. I turned up the heat to 350 and baked it for 10-15 minutes more and it was still soggy. I love the taste, but I can tell it would be so much better if I could get it a bit more crispy. Just tried this recipe. Followed all steps but no crisping at all. Hi Louise! Sorry to hear that.. Did you use a mandolin to thinly slice? I’ve found that’s key to getting them to crisp up. Yes I did use the mandolin on 1/8 inch setting. I followed the directions to the letter, so not sure why it did not work. Even to the point of burning, some were still not real crisp. I ate them, in my veggie wrap, and they tasted fine but not at all crispy. The flavor of this was nice, but the eggplant didn’t get crispy, even after increasing the cooking time 3x. After the initial recommended time, the eggplant was very spongy and soft. In the end, it came out texture wise of eggplant leather or jerky. Sorry to hear that, Kathleen! If you have convection 2225 F should be perfect, with a slight increase at the end. Otherwise, try starting at 250 F and slightly increase at the end for crispiness. If you cook it too high at the beginning it will burn. Slow and low is the way to go here. Also make sure each strip has plenty of room on the baking sheet. And if you’re trying to cook more than 1 batch at a time, that can also create too much moisture in the oven (bake one sheet at a time). Hope that helps! Smart! Thanks for sharing, Patique! I love your recipes, but not this one. I’ve made it twice and both times I’ve gotten limp, slimy slices after following it exactly. Even 30 minutes cooking time at 250… not even close. Eggplant was sliced very thin so it’s not that. Tried higher heat and it burned. We left the last batch in the oven on lowest setting for almost an hour and they *still* were limp. Everyone at my fake bakin competition liked the flavor, but the texture was too disappointing (luckily I had also made rice paper bakin, so I still won!). I won’t make it again, but my suggestions would be to salt and press the water out of the eggplant slices first and then fry. I made this tonight! Pretty tasty but my eggplant did not crisp, even after pan frying it. I wonder if I saturated the eggplant with too much sauce? Will try again, this time with a longer cook time. Still tasted good on the BLT. I made this the night before to minimize prep for eBLTs and it was all I could do to stop eating it and leave enough for the next day. The marinade is amazing and the bacon is so, so tasty! The only change I had for the recipe is that it took me longer than 30 minutes to get mine to the right crispiness/color – more like 50 minutes to an hour. When I tried turning up the oven at the end to crisp up the bacon it got away from me and I burned the batch. It’s certainly more of an art than a science, but worth it! Will make again. This ended up tasting pretty good, but it would not crisp up! After about 45 minutes at 275F they were still floppy, so I upped it to 375F, which did the trick. OMG! I Can’t Stop Eating Them! I too met with wimpy pieces after baking. Luckily I had a dehydrator and in they went for 24 hours. Whala, perfect! Then I put the left overs in a brown paper bag and put in fridge for snacking at work. Well that bag didn’t last very long! I used to do something similar with zucchini, but don’t think I’ll be going back. We are so glad you’re loving eggplant bacon, Laura! I made this and it was delicious! I left out the liquid smoke and just upped the amount of smoked paprika. My first batch was chewy more than crispy, and I had cooked that batch at 225 for 30 minutes in a regular oven. So for the second batch, I was stingier with the sauce and just brushed a bit on. I cooked it at 250 for 30 minutes. And it was perfect! It crisped up nicely. I did use a mandolin to slice the eggplant and it was a regular oven. Amazing recipe! I’m not a fan of mock soy meats, so when I saw this recipe I was instantly sold. I’ve since made this 4 times and keep coming back. The first time I made this I didn’t add as much sauce coating, which still turned out well, but the next few times I drenched them and they were amazing. However, this did require them to be in the oven longer, but it was definitely worth the wait! Glad you enjoyed it, Michelle! So good! I realized during the process that I was out of parchment paper so I used a baking stone, and was delighted when they did not stick to it! Since the bacon recipe calls for half an eggplant, I used the other half to make a batch of your cashewless queso. This was my first attempt at either recipe, and they were delicious together, on top of a big pile of nachos. You rock my plant based world!! Yay! Glad that worked for you, Brandy! Hi Tammy! Sorry to hear that.. Did you use a mandolin to thinly slice? I’ve found that’s key to getting them to crisp up. BUT THIS BACON worked out and was absolutely delicious! I put it in a BLT with spinach and veganaise. Extraordinary. Even gobbled up by my carnivorous boyfriend! I have a question. I made this and the eggplant is not crispy at all. Hi Patty! Did you use a mandolin to thinly slice? I’ve found that’s key to getting them to crisp up. Is there any way to leave out the oil? I am trying to be oil free, and I have all the other ingredients, but might as well eat bacon as fry eggplant for my food. We wouldn’t recommend leaving the oil out as it is a large contributor to getting the eggplant crispy. Good luck! This is a great alternative Bacon recipe for the veggie-inclined. I could see how our vegan friends would appreciate it. We are assembling a guide to all known types of Bacon and have included a link to your recipe on our page. Thanks for sharing with us, Alex! Thank you so much for this recipe! Living in a high altitude I bumped the oven temp to 400• cooked for 20 minutes on each side for thicker pieces, 15 for thinner pieces and the about a minute or two under the broiler for ultimate crispness. My boyfriend commented all of the flavor without any of the cruelty. Bravo and thank you for being a pioneer in cooking. So many have said they didn’t get crispy. My thoughts on this are you’re not necessarily “baking” to crispness, but dehydrating the eggplant. Soooo be cautious in raising the temp. I used the low temp, and kept watching to make sure none were burning. In a reg. oven, it helps to leave the door slightly ajar so the moisture escapes, otherwise it’s too limp or burn. That’s the key, that’s why a dehydrator or air fryer work well. Once I they look brown enough, I take them out onto a paper towel, and within a min they either crisp up or limp. The limp ones I put back in the oven a few min. Voila, it worked well and I didn’t raise the temp. Thanks for this recipe, it’s going to perk up my sandwiches & meals for sure!! I was so excited to try this recipe and while the glaze was delicious, the recipe failed in my oven. I would recommend convection only. It did not crisp up at 225/250 degrees and then burned at 300 degrees. Warning! Annie’s brand of Worcestershire is NOT gluten free. It contains wheat! I love your recipes but want to warn those with Celiac that may try this. I’ve only found one vegan and gluten free brand of Worcestershire. It’s hard to find and expensive. It’s the wizard brand but make sure it’s the vegan and gluten free one (they have others). Will you please update this recipe for the sake of my fellow Celiacs who may not check? Nevermind! I see now that you have a separate link to the GF one. I think that needs to be more clear. As it reads now it looks like you are saying Annie’s is GF. i tried the recipe from delish, with just 4 ingredients. soy sauce, maple syrup, paprika, and extra virgin olive oil. i put it in the oven at 300 degrees for 45 minutes. first time i burned it… second batch was made this morning at 250 degree oven for 1 hour, i think i put too much soy sauce in my sauce mix.. it comes out still almost goo-ey, but crispy on the outside.. i will be trying your recipe on the last of my eggplant. any suggestions on what happened? Not sure, as that was not our recipe and is from a different site. Better luck with our version! I did this without the liquid smoke and it tastes really good! Lots of flavours even without the smoky tast it’s delicious. I absolutely love this recipe. The flavor is awesome. I did make some minor adjustments – rather than using liquid smoke I use the South’s african Smoke spice from Trader Joe’s and I added a touch of garlic and onion powder. As for the cook time – I found it not to be substantial enough to crisp it up so I bake at 225 for 1.5 to 2 hrs. I tried slightly higher temps but it got too dark. But it was still great tasting. I also cut it by hand as the mandolin made the slices to thin for my liking. Great work on pulling these flavors together. I even use some of the leftover glaze on things such as Salmon and tempeh bacon that I had in the fridge. Make sure you check on it periodically in the oven so that you don’t overlook. Also I like to give it a second glazing halfway through to intensify the flavors. Love this recipe and LOVE this blog! I swear I’m on here almost daily looking at new recipes and referencing things. Thanks for doing what you do! On this recipe: My partner and I found these tiny little eggplants in the store for really cheap and decided to experiment. I’m not usually a fan of eggplant, but the little ones were just so cute I thought I’d give them another try. I found this recipe after we came back from the store and had to make several alterations based on what we had on hand. We subbed aminos for tamari, agave (just 1 tsp) for maple syrup, and eliminated Worcestershire and liquid smoke. The flavor was probably not a savory or smokey as yours, but it was SO delicious! We are making them again today to have a variation on BLTs. Thanks again for all of your fabulous food inspirations! Pretty good! I ate this in an ELT with some homemade pesto. So this isnt bacon obviously, the texture is a bit leathery like dried fruit, but not as crispy like bacon. I think its similar to shiitake bacon! Which i like. Next time I would add less sweetener. I like my “bacon” with just a hint of sweetness. I found this recipe to be one that takes patience to get it to be good. If its limp, soggy, or still wet, you definitely need to put it in longer. It would be great cut up into salad or a carbonara. No I didn’t but I read a comment above said they fried the bacon, I will try that. I made this the flavor was amazing but I can’t get it to crisp. What am I doing wrong? Did you slice the eggplant using a mandolin? Sorry picture doesn’t show. Bed of lettuce, cut up tomatoes & eggplant bacon! Outrageous! Addictive! I just don’t understand what you mean about storing these — does anyone manage not to eat them all right off the pan? (I’m trying my hardest to have some left to share.) Holy smokey maple, Batman, this is a good one! I guess people who hate eggplant may not be thrilled, because I at least am still aware of it being eggplant even when nice and crispy … but I doubt any will be left long enough for me to find some tasters who hate eggplant. Not crispy at all and it stayed and the oven at 270f for almost an hour. Sorry but I am very disappointed. The taste is good though. We are far far from bacon! Hi Katia! Did you use a mandolin to thinly slice? I’ve found that’s key to getting them to crisp up. I made this for the veggies at our scout camp and they loved it. This one is now in my recipe book. 3) I think I will try throwing all of the marinade in a bag and toss in the eggplant, soak a bit, then lay the pieces on a wire rack versus parchment sheet. Tasty. But even after 40 minutes, it didn’t crisp up. Even after raising the temperature, it didn’t crisp up. After reading all the comments, I decided to follow the recipe, but reserved the right to pull them from the oven if they didn’t crisp. Sliced them so thin that they were translucent. I couldn’t see how they would crisp on parchment paper, but let them cook on 225, then 250 for a full 50 minutes. Finally pulled them out, still pretty limp, and fried them in olive oil in my cast-iron skillet. They crisped up immediately, but I had to be careful not to burn them. I think next time I’ll just fry them – not as healthy, but quicker and easier in the long run. Taste was great though, and amazing on my faux BLT! I made this today. I think it would be safer when using a mandoline if you cut the eggplant into four rectangular shapes instead of triangular. The food holder would get a better bite into the eggplant and thus making slicing it easier. I tasted the eggplant bacon right out of the oven and didn’t think that it tastes like bacon. I am going to try it in a BLT, as a turkey club, and with eggs. I’m not a vegan so if this does not knock my socks off, I’ll revert back to turkey bacon. One other thing, the recipe mentioned marinating the eggplant in the sauce. I picked the right choice of brushing it on. I think the word marinating could be confusing to some cooks. I made this but I used aluminum foil sheets because I didn’t have parchment paper. I see that ok? Hi Courtney! That should work fine! I made this and followed the directions exactly. I ended up baking mine for an hour because it wouldn’t crisp up, and finally we took it out and ate it soggy because it was way past dinner time. Not sure where I went wrong. Checked the recipe like 6 times. I don’t know. Yes I just had the same experience. In the oven now for just about an hour, with no luck. After reading the reviews, I went into this recipe expecting floppy eggplant but I loved the idea of it (especially for a BLT). Long story short, I got floppy eggplant. I used a mandolin for thin slices and then I baked it at 225 for about 45 minutes and then kicked it up to 250 for about 10-15 minutes. It dried the eggplant out nicely (like the texture of dried apples) but was definitely not crispy at all. I might try this again but drain the eggplant first with salt. Or I might just embrace the flop and slice it thicker for a hefty sandwich. For those of you that have a hard time getting your bacon crispy, try drawing out the water from the eggplant. Place the sliced eggplant in a colander, sprinkle with salt and let sit for an hour. Rinse, drain, and pat dry. Then you can start at the beginning of Dana’s recipe. So good!!! Made “BLT’s” with mine! My meat eating husband liked them! I made this recipe tonight…it was amazing….seriously amazing!!! This looks incredible! Where do you buy liquid smoke? Hi Rosie! Here you go! I’ve made this several times and it turns out better each time. It makes wonderful vegan BLTs. I also tossed some chickpeas in the leftover sauce and roasted them. I love this recipe! I just made a batch and it was pretty crispy and tasty! omitted the liquid smoke, added some brown sugar because I only had 5 drops of maple syrup left. I experimented by doing a batch using a potato peeler and then “thin slicing by knife” and the potato peeler version turned out great. I also grated the heals of the leftover eggplant and experimented with some “bacon bits.” I’ve got a mandoline coming, hopefully it works as good as peeler, because using a peeler is a pain. Unfortunately I had the same experience as many others. I tried making it in the over per the directions low and slow, up to 250 for additional time, etc and letting it cool but these did not come out crispy at all. I tried pan frying and it also didn’t work in the crisp department but the flavor was a lot better pan fried than baked. Thanks anyway. Delicious. I made this after having a similar eggplant bacon at a restaurant (in the Deep South, surprisingly!). It’s a great recipe. I omitted liquid smoke and swapped honey for maple syrup bc that’s what I had on hand. Next time I will scale down or omit the sweetener all together. I used a whole eggplant and had enough marinade without doubling the recipe. Brushing it on and making slices ~1/16″ is key. Some slices were thinner and those stuck to the pan. I prepped the sheet pan with foil and olive oil for easy cleanup. The oven was set to 250F non-convection and two sheet pans took ~ 1 hour. Can’t wait to make a eBLT with end of summer tomatoes. Thanks Dana! Sorry to say but my family is a meat loving family. I’m always trying to find different ways to add veggies in our meals and by chance came across your recipe. My question is how close dose it taste like bacon? If I use it in a casserole or something would they be able to tell? I even want to try this and I don’t even like egg plant. Hi Cindy! While it does not taste exactly like real bacon, it is a great alternative for people that follow a plant-based diet. I recommend trying it out for yourself, as it may surprise you! Happy Cooking! If you wanted to not use liquid smoke could you just leave it out? Hi! You can omit it but we do find at least a little bit necessary for that smoky “bacon” flavor! I followed the recipe exactly and the flavor of the marinade/sauce is amazing. Unfortunately they came out soggy and floppy – lunch meat consistency. I was looking at the other comments and tried upping temp & time, nothing. Seems like a lot of people had similar issues. Maybe it varies by oven. This looks so good! Would I be able to make a batch and freeze/refrigerate them for future use? Store in a sealed container in the refrigerator up to 5 days or in the freezer up to 1 month. To reheat, heat a skillet over medium heat, add a little oil of choice, then heat bacon on both sides until warmed (be careful not to burn). What a complete flop. I made this and it did not crisp up AT ALL. I had it on 225 for 30 minutes, switched to 300 for another 5 minutes, and turned on the broiler for 7 minutes in a last-ditch effort to get it crispy. It didn’t work. The sauce might be good as a marinade for tofu in the future, but this eggplant recipe was not good at all. Oh my gosh, this eggplant bacon is AMAZING! I made it today using 3 Japanese eggplants and, aside from raising oven temp (to 350), followed the recipe exactly. Had ‘bacon’, lettuce, tomato and vegan cheese sandwiches on homemade wholewheat bread. DELICIOUS! My meat eating husband also really liked it. It is my new addiction. I wish I could post a photo of my sandwich. Drool worthy. Thank you so much for this recipe. Also delicious with pumpkin skins….I roasted whole pumpkin wedges leave in the pumpkin seeds as well when roasted remove the flesh from skin this makes delicious puree or soup the roasted seeds are moorish as a garnish on soup or salad……….then roast the skins for a little longer they will end up being a cross between crisp and chewy but awesomely delicious…….best thing no wastage. Pumpkin and maple is a match made in heaven. I’ve made this twice (tried to), and the eggplant comes out limp and sticks to the paper. If I leave it in too long, it burns. What am I doing wrong?! The taste is great, but the texture…not so much. Any tips? Ok, reading through some of the comments and got some good tips on getting the crispiness right! Made these but burnt most… Didn’t use parchment paper duh…. The few that survived we’re amazing!!! My wife and I were picking at what we could. Making a E.L.T. sandwich today for lunch. Eggplant, lettuce, and tomato! Would love to see your variation of something like that. Thanks again for another incredible recipe!!! I’ve cooked several batches, and have experimented with temps/bake time. I just cooked a batch at 325 convection for 20 min, flipped them, and cooked another 10 (watch for burning towards the end). They came out perfect! Slightly crispy/chewy. I also marinated beforehand for about 30 min in a double batch of liquids. Thanks for the tips! I had trouble getting the crispiness. I made this and after 40 minutes at 225F – 250F had soggy eggplant bacon. Luckily, I solved that problem by turning the oven DOWN to 200 and cooking until crispy. That way – no concerns about burning and delicious crispness. Thanks Dana! Unless you’ve been vegan you’re whole life and have no idea what bacon actually tastes like, just…..NO. Followed the directions precisely and after the allotted time it was about as “crispy” as cottage cheese. So cranked it up to 350. Still no luck. Time to get serious. Crank up the broiler. After nearly 10 minutes like that I had some burnt edges and the rest was still a soggy piece of vegetable. Ok, so we aren’t going to get crispy. Maybe we can still get something like bacon. Floppy bacon. To me it tasted a whole lot more like BBQ eggplant than anything bacon-like. The true test was my vegan teenager. She took one bite, spit it out, and said “Oh Lord Jesus, no” and left the room. So while I appreciate the time and effort that went into coming up with this and sharing it, this is something that calling it “bacon” outside of California, Oregon and Washington may get you waterboarded. I bought your cookbook a few weeks ago and been using it ever since. My family is loving all these recipes. My son and I are vegan and I’m trying to help my boyfriend with healthy & Enjoyable eating. He had a kidney removed from cancer and also has melanoma(stage one). With this new way of cooking and eating he lost 10 pounds and loves all this food. He is not ready to be a vegan but these recipes are a good start and better then eating all of what he is use to. I have to start taking photo’s of my dishes. Everyone comments not only how it taste but also the presentation. The cooking time is way off, and so is the temp. I’ve used the other half of the eggplant and got slightly better results at a higher temp and lower time but still, it was pretty flavorless. That’s a first timer though, I usually LOVE your recipes. I used the link to purchase the vegan Worcestershire sauce. I read the ingredients though it is vegan, it is not a gluten free item. Was there another product that was GF? Is there an alternative for 2 tsp liquid smoke? Yum! I sprinkled salt on the eggplant slices and let them sit for 20 minutes to take out some of the water. Rinsed and patted dry. Then, brushed the sauce on. I baked on wire cooling racks. Followed your baking instructions. All worked quite well. We had BLTs for dinner. Hooray. So, so yummy. Thank you for the recipe! Anyways the flavor was good and bacon-y, I just absolutely detest pepper so I would omit that next time because for me, it was just too spicy. But very genius!! No Words OMG!!! So Good Perfect with bean burgers!!! I just made this and it turned out great! I made two trays at once so I bumped the oven temp up to 275 and baked it 15 mins longer. If anyone is having trouble with crispiness, I would suggest sweating out the eggplant first. Salt both sides and let it sweat out for about 30 mins and pat dry! Just be careful about your salt levels in the marinade. “Sweat”? Do you mean, salt both sides of each “bacon” slice, or slice the whole veg in half and salt just those two halves on the cut-sides? Salt each side of the slice! As it sits you’ll see beads of liquid from the eggplant get pulled to the surface and you can pat away the excess. Sorry for the silly question , but do I peel the eggplant for this recipe? This recipe definitely takes a wee bit of playing around with it but it’s definitely worth it! I also had the same problem with the eggplant not crisping up following the timeline and heat setting that Dana provides in the recipe. I tried it both on convect and regular and found that after 30 minutes it was still super floppy. The good news is…..you just need a wee bit of patience. I increased the heat to 250 and cooked it for about 20 minutes longer (50 minutes total cook time). Then I turned the oven off and just let them “cool” in there. After about 20 minutes I opened up the oven door and voila…crispy eggplant! I also recommend just slicing up the whole eggplant and making one batch right after the other. You’ll have enough sauce leftover for the extra batch anyway and it’s always nice to have ready made stuff in your freezer. I’m also a liquid smoke fan but I’m going to try just half a teaspoon next time. I like the smokiness but the overall flavour is so good that I don’t think it needs quite that much of it. Just depends on your tastes though. I made this along with the aquafaba mayo and had a BLT. I really don’t miss meat but I do miss the comfort of certain meals that I had as a kid before going vegetarian. This combo definitely hit the spot and fits the comfort food bill perfectly for me. Thanks for the great recipe’s Dana! Thank you for taking the time to develop this recipe Dana! I did need to extend the baking time considerably but was able to achieve nice crispy “bacon”. I may leave out the liquid smoke next time; that flavor may not be for everyone. I used a mandolin to slice the eggplant, brushed on the sauce, baked on a parchment lined baking sheet in a non-convection gas oven at 250 degrees for about an hour (but I like my bacon very crispy and not chewy), and cooled it on a wire rack. It turned out great! Tried this recipe and it worked really well! Time and temp that you recommended were perfect. My meat-eating friends were even impressed, we made it for BLTs. Will be making this again, thank you Dana! This is a brilliant recipe! I’ve made it twice now – once as a side to your southwest tofu scramble, and once in a sandwich with avocado, lettuce and tomato. I do find I have to leave it in the oven for a lot longer to get it crispy (maybe about an hour) but it’s worth it in the end. These did not crisp up for me, but I wonder if I should have used a different oil. However we fried them quickly in a pan and they turned out great! We’re also going to try them out in our dehydrator and see if we can make some vegan jerky! I made these last night and then a second batch this morning. They are awesome. Thank for the recipe. I just wanted to add a tip to those without a convection oven. I baked for 50 minutes at 255 degrees and let sit in the oven until completely cooled. I didn’t have parchment therefore uses a silicon baking mat sitting on a cooking stone. Worked like a charm! Oh and just use the whole eggplant! You’ll regret not making more! This is genius, but I think I can see why so many people are having problems. (btw Dana, I love MB and am a happy photography school subscriber and was introduced to Fizzle through you guys, which I now LOVE). First, if you try to slice the eggplant with a knife you are doomed. And this is coming from a chef who can cut anything with her eyes closed. Eggplant is just too spongy overall to make into nice, neat, even, THIN slices. Use a mandolin or even a vegetable peeler. (I don’t have a mandolin but I quartered my eggplant and used a vegetable peeler thereafter). I think if people got the thickness right, the rest is a breeze. Also, I recommend that people stop being impatient! 20-30 minutes might not be enough, especially if you DON’T have a convection oven. My first batch was delicious, but not crispy (due to hand-slicing). My second batch, I got them nice and thin and it took a good 40 minutes, maybe a little more, til they got crisp. And when they did? BOY I was a happy customer! Eating a BLT right now as a matter of fact :-) And both my kids, ages 7 and 9, loved this. So, to everyone who is having trouble! Your eggplant needs to be THIN, very THIN, and if it’s not crisping up after 30 minutes, just let it go a little longer AT THE SAME TEMP, and it will get crispy! Bumping up the temp is just going to cause our eggplant to burn! I did mine at 250 for roughly 40-50 minutes in a really old oven and they are sooooooo goood. I also had your cashew-less queso last night that I combined with elbow mac and vegan chili to make a “hamburger helper” type of thing last night, it was SSOOOOO good! Hope this helps a few folks get this recipe right because this is sssssssooooo worth it! Love you guys eternally, and you are my inspiration as I start my own food blog! (Lifelong dream here). Personally, I loved this recipe. 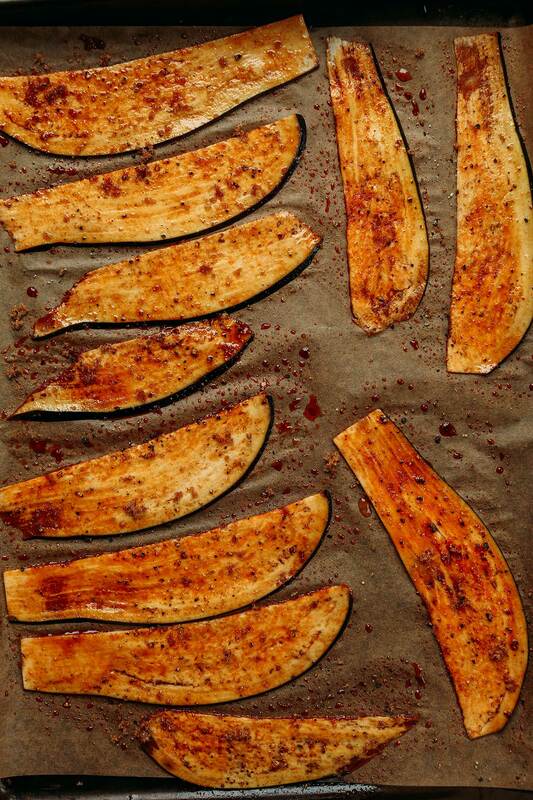 I dried out the eggplant first, with the strips on parchment in the convection oven at 250, for about 20 minutes. I let cool, then put the marinade on, and back in the oven. Pulled them out, nice and crispy, and vegan son says, “it just tastes like eggplant”. (I thought it was amazing, and that the secondary flavour was eggplant.) Ugh, so I slopped a bit more marinade on them and popped them back in the oven. I then didn’t cook them long enough (a bit too moist and limp), and pulled them out when everything else was ready. I still thought it was really good, but kids prefer the rice paper “bacon”. Oh well, I’ve been nibbling on them the rest of the afternoon, and they actually crisped up again. Would totally have loved this with pancakes, or in a BLT. To clarify, it will not be stick straight and crispy like a cracker right out of the oven. But it will become dried out and, after cooling for 5 minutes out of the oven, should be crispy! I’m eating this now and while I love the taste, I couldn’t get it crisp either. I baked it for well over an hour. It would definitely substitute for bacon on a BLT and be really good, just no crisp. I also had issue with a lack of crispness using the convection oven and the temperature guide you recommend, but as one other reviewer mentioned, I did toss the eggplant strips into the marinade and then laid them out on the parchment paper. Next time I will baste them instead and see how that goes. When cooking eggplant in the past, I’ve always salted my slices and allowed the water content to be pulled out before cooking. If I don’t have any luck with the basting next time, I’ll try this method the third time. I’ve also heard that cooking them on a wire rack allows the moisture evaporate all around. The liquid smoke was interesting, but a little strong. Will probably cut back on that next time, too. do you think these would crisp up better if put on a cooling rack instead of parchment paper? or would they burn? That might help actually! let me know if you give it a try. Hello- what a great idea! I was just wondering if liquid smoke was bad for you? Is it carcinogenic? Really looking forward to trying this. Thanks. I think I found the problem that many are having. The first batch I made, I dipped the eggplant in the spice sauce. It was hard to not jump in after it myself, it smelled so Divine! While that batch turned out incredibly flavorful, the strips were soft and limp and the flavor was pretty intense, even after doubling the baking time. Then I re-read the recipe and the comments, and wondered if the problem might be too much sauce? So next batch (I’ve made 4 batches just today…!) I did exactly what Dana said to, and *brushed* the sauce on. What a difference! Perfect flavor, perfect texture — stiff and crispy, yet with just a little give. While I’d like to take a bath in the sauce, this is a case where less is more. This was a total disaster for me, which is the first time ever this has happened with one of your recipes! Shucks! So if you have convection 2225 F should be perfect, with a slight increase at the end. Otherwise, try starting at 250 F and slightly increase at the end for crispiness. If you cook it too high at the beginning it will burn. Slow and low is the way to go here. Also make sure each strip has plenty of room on the baking sheet. And if you’re trying to cook more than 1 batch at a time, that can also create too much moisture in the oven (bake one sheet at a time). Hope that helps! I definitely did all of this- lots of room, started st the lowest temp…..Started at 225, up to 250 after most of the prescribed baking time, then 300 for the last 6 minutes. GOt kinda charred. I don’t know, maybe this is just not a recipe for me. The flavor on this is SO GOOD that I’m going to keep trying until I get it right. The first time I foolishly used a silpat instead of parchment paper and the eggplant just didn’t crisp up (not crisping seems to happen frequently with the silpat). I made it again today on parchment and I think I sliced the eggplant too thick — I cooked it extra time and it still didn’t get crispy, except around the edges after I finally broiled it for 5 minutes. But it was still super tasty on wheat bread with vegan mayo and basil. The marinade was so good and bacon-y that I made an extra batch and used it on tofu, which made an awesome blt. Smoked paprika is a good substitute for liquid smoke ? This sounds amazing! Have you ever tried doing it in a dehydrator? I’ve made eggplant “chips” so I’m sure it would work out well. I’m LOVING all your recipes and have tried a number of them that are all fabulous! Thank you! Haven’t tried that! If you give it a try, report back on how it goes! Thanks for being a fan! I made this today! Oh my god! So good! I made a eggplant bacon, lettuce & tomato sandwich! Yummy!!!! I live in Australia. My local cruelty free store stocks liquid smoke, but there are two kinds (Hickory and Mesquite). I’ve never used this before, but have noted that you’ve used it in a few recipes. What kind of liquid smoke would you recommend for this recipe, and would it be suitable for the other recipes? Hi Jes! Hickory is a good all-round wood that produces a sweeter fragrant smoke. Mesquite produces a very strong, distinctive smoke. I think both could be used, just depending on what flavor appeals more to you! Good luck! Have done anything with this to replace gyro meat? I looked up Annie’s vegan Worcestershire sauce and it is NOT gluten free. It says on the bottle that it contains wheat. The recipe and the idea of using eggplant for bacon is fabulous. What would be the substitute? She didn’t say that Annie’s was GF; there is a separate link to The Wizard’s brand which is GF. On to the eggplant bacon recipe……. This is the first of your recipes that I’ve had a tough time with. :/ I followed the instructions/ingredients to a T. After 30 mins I noticed they were quite floppy still. So I popped them back in and increased to 300 degrees. Took them out after another 30 mins and they are still slightly limp but now curled up on some edges and floppy. Zero crispiness. Total bummer. The flavor is amazing though, just wished they would have cooked up crispy. Will attempt again soon. Any clue as to what could have went wrong? Mine, too. Help. It still tastes yummy just not sure how to get it crispy. I wonder if it has to do with the oven temperature question I asked Dana above. She hasn’t replied to me, but it does look very cool. I haven’t tried it yet, waiting to get a reply on that. But reading these posts I think I was right. I had the same problem. But reheated it on day two on the stove top as she recommends and threw it on a sandwich and it’s so good! The burnt ones ended up ok tasting like a true BLT!! Going to retry with the oven temp recommendation. Hmm, so if you have convection 2225 F should be perfect, with a slight increase at the end. Otherwise, try starting at 250 F and slightly increase at the end for crispiness. If you cook it too high at the beginning it will burn. Slow and low is the way to go here. Also make sure each strip has plenty of room on the baking sheet. And if you’re trying to cook more than 1 batch at a time, that can also create too much moisture in the oven (bake one sheet at a time). Hope that helps! Tried this, and it didn’t work out. I definitely sliced my eggplant thin enough, and it never crisped up. I even broiled it for a few moments, but it stayed pretty floppy. The flavor was okay, I think if the eggplant flavor hadn’t been so prominent it would have been gold. Maybe it came through more from not crossing up? Looking forward to trying that coconut bacon! Can’t go wrong with coconut. ?? Hi Sarah! I don’t find the eggplant flavor to be prominent, but I suppose that’s personal taste. I find this far superior to coconut “bacon.” As for the floppiness, try the baking temp to 250 F at the beginning and then slightly increasing at the end for more crispiness. And, as a reminder, it does crisp the more it cools. Good luck! Just tried it tonight… LOVED IT. What type of eggplant do you recommend? Thanks! Just a regular eggplant! No need for Japanese or any particular variety. Hi! This looks so delicious and easy! I have tried eggplant once and didnt like it but desperatly want too so Ill try this one question though, tamari? Where do i find it/or whats an alternative? Thank you! Hi Cierra! You can purchase tamari online or in most grocery stores! Additionally, you could use soy sauce as a substitute. This looks amazing! I have everything to try it, even found vegan Worcestershire sauce! So I’m almost ready to go. But first I wanted to check with you on the oven temperature. It seems so low. Can you just confirm that please?? Hmm, so if you have convection 225 F should be perfect, with a slight increase at the end. Otherwise, try starting at 250 F and slightly increase at the end for crispiness. If you cook it too high at the beginning it will burn. Erm, 2225 F? I’ll assume 225 F, unless we’re cooking with a blowtorch, lol. I did 225 in regular oven (no convection option) after 20 min. and still no change turned it up to 350 for another 10, half burned, so thinking this was too high obviously but hubby said throw it away, this was the first time ever he has said that, they were still soft…will not try again. I had a similar problem with a regular gas oven but turned it to 250 after 20 min and and 300 after it was still not crispy at 30 min. half was burnt half was limp. Will try again and go for more uniform cuts on the eggplant and not sure about the oven temps yet. PS not that this isn’t 5star recipe but it won’t let me change it on my phone to anything less? I think the only improvement I would recommend just a technique for using a regular non convection oven. Thanks Dana! Hi, I just made this and I’m sorry, but I didn’t care for it at all. The entire thing (cue “Taps” music) went into the bin. I’m not against using a little liquid smoke, but this tasted extremely artificial to me and not like I remember bacon tasting at all. Still a fan of your blog and recipes so (cue upbeat, happy music) have no fear, you haven’t lost me! Thanks for the honest feedback. I definitely use a small amount of liquid smoke in this recipe, however, it’s not an appealing flavor to everyone. I do find at least a little bit necessary for that smoky “bacon” flavor. Next time you can try omitting it! I used a grinding of Trader Joe’s African Smoke seasoning instead of the liquid smoke. It does not have an artificial taste. I noticed that the market has 3 flavors of liquid smoke. Perhaps the flavor you used was not the best one for the bacon flavor profile. Fortunately, Liquid smoke is not artificial as it is made from real smoke! Not saying it does not taste artificial, but it might be a mind over matter thing? I don’t know, but once I learned that its real smoke condensed with water I did not feel like I was escaping the “real” smoked flavor of something and it has tasted better to me. We also do not love liquid smoke, I omit it in this recipe & the smoked paprika gives it all it needs! This is amazing without it! I urge you to try it again minus the liquid smoke… it’s amazing! Thanks for trying the recipe before posting. One of my big pet peeves is people saying “how good this looks” in their post and not ever tasting it. The review section for recipe blogs should only include how it tasted after you make it. Sorry for ranting but I had to scroll past 20 posts before I learned anything. Preach! It’s my biggest pet peeve! Jefg, thank you!! One of my pet peeves as well. I’m wicked excited to try this, but we don’t have a convection oven. What would the best approach be to cook? Oh! You don’t need one. Just bake for a little longer! Convection just speeds the process. Not sure if this was asked yet, but what kind of liquid smoke? When I go to the grocery store there’s two different kinds. So I haven’t made this… yet. BUT I just wanted to tell you that it looks amazing and you are absolutely brilliant. That is all. Dana, my jaw dropped when I saw these and read the title! Oh-my-yum!!!! I haven’t had a BLT in so long!! I used liquid aminos and it was delicious! I tried the same sauce with portobellos thinly sliced and that was amazing too. I used convection and did need to increase temp for 5 additional minutes to 300 to add crispiness to the eggplant. I live at about 3800ft altitude, don’t know if that made a difference. Thank you! The whole family enjoyed our BLT night! I usually have to put the broiler setting on my oven for a few minutes due to high altitude as well. Have been eating crisp eggplant since childhood and love it . Best way to use is im a subway sandwich with spinach tomatos cucumber fresh cilantro sliced onions sliced jalapeños and lime juice salt and pepper . Bread should be toasted before making this sandwich. Oh yeh don’t forget to put crispy eggplant sliced!!!! Best sandwich ever! OMG! That sounds amazing Moulitka! I have an eggplant in the fridge…I know what I am making for supper. How did you get the eggplant crispy. I made it and it was so “flabby”. (Very limp) It was not crispy at all. I think it would have been good if I could get it nice and crispy. I thought about frying it after baking it. Any suggestions. I had the same issue today. Wouldn’t crisp up. I wasn’t using it today just prepping ahead so I am going to pop it in a frying pan when we use it with our BLT tomorrow. See if that helps. Sounds like a good idea. Let me know how that works. I thought about not even baking it first, just frying in the cast iron. Frying it did crisp it up. However, it did quickly burn in spots too. Overall though, much better. ah I need this in my life! Do you think it would work with zucchini or is the water content of that too high? It’s all I have in my fridge right now! I think the water content will be too high, but let me know if you give it a try! Could you use honey instead of maple syrup? I can’t eat maple anything. I would sprinkle kosher salt on the zucchini slices and let them sweat for a little bit. Then I would dab the water away with a towel and wipe away the salt. Then proceed with the recipe. Should reduce the water content. What, exactly, is in liquid smoke? I only ever heard of it once I moved here to Canada. (from Australia) What alternatives are there? What is liquid smoke? Would it or an alternative be here in Australia? I am Australian and got it from BBQs galore but you can also buy it online. Some of the specialty supermarkets may stock it in their sauce ir international sections. Hello. I get this from IGA in Melbourne. It’s a brand called “Stubbs” they do Mesquite and Hickory Smoke. Life changing!! Now in the oven, becoming bacon! Love the idea of putting it in a quiche “lorraine”. I’m curious about the liquid smoke. What’s in it? Could you use something else in its place? Liquid smoke is simply distilled from smoking wood. Wood smoke and water. Commercial products sometimes also include vinegar, molasses, salt and caramel color. There is an old episode of Good Eats with Alton Brown from Food Network which shows how to do it yourself. You might find it on YouTube. Have you ever tried shiitake bacon??? All it needs is EVOO, salt and pepper at 400 for about 15 minutes. The shape is obviously different but the flavor and texture are SCARY GOOD. great tip! Will try it! Zucchini make nice crisps eggplants do as well but they also go chewy like bacon. Fruit blended comes to mind ? I cant wait to find out if people are liking this, we have eggplant sortages here due to failed crops. Yep our egg plants, courgettes, peppers etc are rationed, tough times ! OMG you have just blown my mind. I have to try this, this weekend. I never would have thought of eggplant. Awesome! I need to make this! I see EBLTs with avocado in my near future. Thank you! Do you mean that you can freeze it for 5 months? Looks amazing! I was wondering the same thing 5 days in fridge or 1 month in the freezer? 1 month in the FREEZER – thanks! Just added eggplant to my grocery list! Dana, this looks so good! I’ve been looking forward to seeing this recipe for some time now and plan to make it this weekend. Do you think liquid aminos would work OK in place of the vegan Worcestershire? Thanks! Hi Lauren! I have never used liquid aminos, only coconut aminos, but it *should* work. Let me know if you give it a try! I will be using liquid aminos to make this recipe tomorrow to go along with my vegan quiche! I will definitely let you both know how it goes! Thank you Dana for such awesome recipes time and time again! I’ve tried and devoured plenty of them! I use liquid aminos, it works fine. 115, how long is personal preference. I start with 15 hours, then check every 5 hours until it’s the desired crispness. I use Bragg amino in place of tamari all the time. Works great!